The name ‘Arthur Bend’ is found on the Bottesford ‘church list’ of WW1 Servicemen. However, this could refer to either of two men, Arthur Bend and Arthur William Bend, both of whom lived in Bottesford in the years before WW1. This page provides biographic notes regarding Arthur William Bend, who served in the Royal Army Medical Corps (RAMC). Information for Arthur Bend, who was a Captain in the Royal Engineers, are given on a separate page. Arthur William Bend was seventh child of Bottesford man John Bend and Mary Ann Bend (nee Milladay), who came from Welby, Lincolnshire. In 1891, John and Mary Bend lived on Normanton Lane, Bottesford, with six children, Alfred (aged 16), Thomas (13), Kate (11), Charles( 9), Alice ( 5) and Rueben (2). John Bend was a chimney sweep, and his older sons Alfred and Thomas were at work as farm servants. In 1901, John and Mary were still living on Normanton Lane, with sons Reuben (12) and Arthur (9) at home. In 1911, Arthur had left home and was employed as a waggoner working for farm foreman William Vickers (64, from Aslockton) at Horsendale Farm, Nuthall, Nottingham. The data found is very limited. 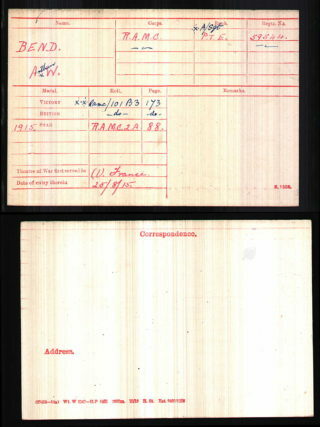 A man named Arthur W. Bend has a Medal Index Card which records him as 59544 Private, later Acting Sergeant, RAMC, awarded the 14-15 Star, British War Medal and Victory Medal. 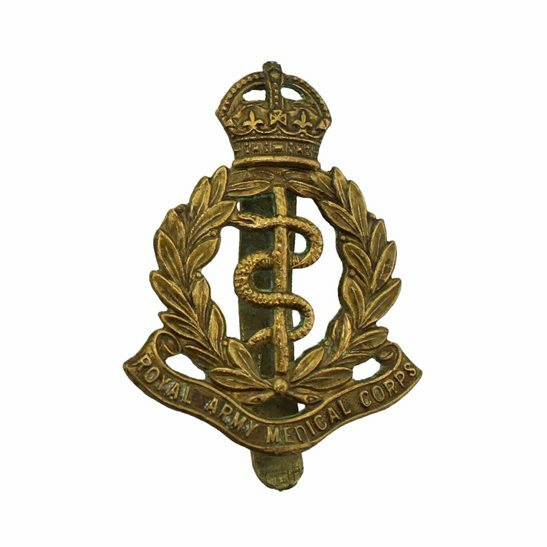 There is also a RAMC medal roll entry which records the same soldier as having the rank of Acting Sergeant, presumably dating from late in the war. No further details have been located, and the information presented here is not explicitly linked to the man from Normanton, though it probably is the same man. Records are sparse and difficult to corroborate, but it is probable that Arthur William Bend was recorded in the 1939 Register at Rotherville, Highfield, North Wingfield near Chesterfied, Derbyshire, a single man, a colliery worker born on the 29th September 1891, living with the Hawksworth family. In addition, it appears that he died in the Chesterfield area in 1977, aged 85.